The NAB Cartridge (named after the National Association of Broadcasters) was a mainstay of radio broadcasting from the late 1950s-1990s. It was replaced by the mini disc and computerised broadcast automatons. NAB Cartridges were used primarily for jingles, station identifications, commercials and music. Each cartridge comprised of several recordings of the same, short jingle. Mechanically the tape is designed to play on an endless loop. This required limited manual operation such as rewinding or fast-forwarding, and enabled short recordings to be accessed efficiently and accurately during live broadcasts. Because they were used in broadcast NAB Cartridges often used the best quality tape available at the time which was usually AMPEX. As readers of the blog will know, this is bad news if you want to listen to the tape a few years down the line. 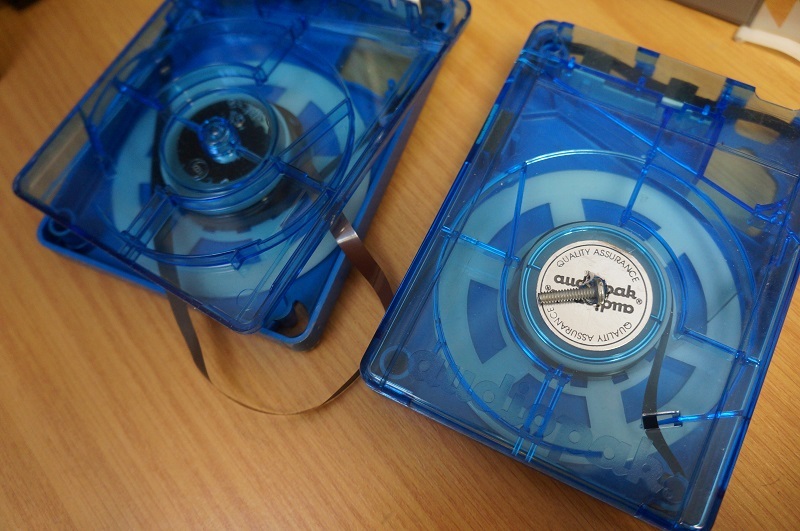 We baked the tapes so they could be played back again, and were then transferred using a SONIFEX HS Cartridge player. You can listen to one of the incredibly cheesy jingles below! This entry was posted on Wednesday, November 13th, 2013 at 3:18 pm	and is filed under Audio Tape. You can follow any responses to this entry through the RSS 2.0 feed. You can leave a response, or trackback from your own site.